Robbie Williams is working on new music with Take That. The 42-year-old singer has reunited with his former bandmates, Gary Barlow, Mark Owen and Howard Donald, to write and record a number of tracks for their Greatest Hits album, which will be released next year to celebrate the 25th anniversary of the group. 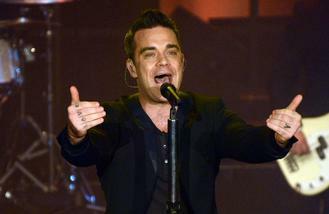 A source told The Sun: "Robbie loves being part of the creative process and he has lots to offer. "He influenced the last album he featured on with his electro sound, which reflected his solo work at the time. "He's a changed man since studio sessions back in the day and takes things far more seriously." Robbie - who first quit the band in 1995 - previously rejoined the group in 2010, featuring on their 'Progress' album and joining them for the 'Progress Live' tour. He left again in 2012 but frontman Gary has repeatedly said that he is welcome back any time after they put their feud behind them. It was previously revealed that Robbie is now "at peace" with Take That and has been keen to reunite with them to celebrate their remarkable career. An insider said: "Robbie says he is up for coming back and performing again. He feels that he is at peace with the group and wants to help commemorate their astonishing rise." It has not yet been revealed if Jason Orange - who quit the band in 2014 - will return to mark the anniversary but Gary has previously insisted it is unlikely. Nick Jonas doesn’t mind criticism, as long as it’s an educated comment. Kendrick Lamar is being sued over his track 'I Do This'. Actor Liam Hemsworth has made it clear he is not engaged to wed singer Miley Cyrus. Taylor Swift is enjoying having a break from making music and isn't certain when she'll next release an album. Pharrell Williams has joined the line-up for Stevie Wonder’s highly-anticipated gig in Hyde Park this summer. Skepta will release his new album next month. Gwyneth Paltrow got access to best friend Beyonce's surprise new album and music videos far ahead of anyone else. Singer Justin Bieber feels no shame over being a grown-up colouring book fan. Nick Jonas had potent onion breath the first time he ever kissed Miley Cyrus.